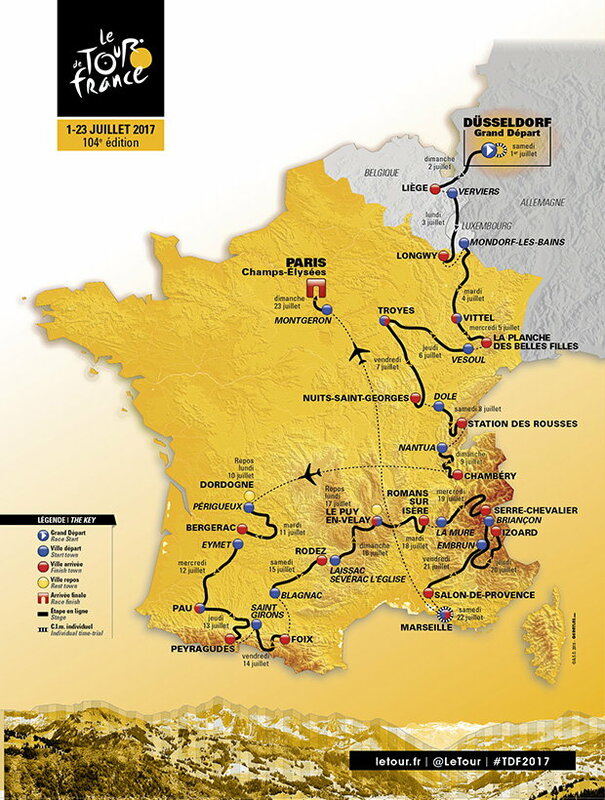 The start date for the 2017 Tour de France is 1st July 2017. The greatest sporting event on the planet. Honestly, it makes other events look a little rubbish in comparison. – The football World Cup? Bunch of overpaid posers. – Wimbledon? More like a fashion parade and an excuse for Pimms and strawberries. – As to the big horse racing events… more like animal cruelty. Don’t get me started about the people who go and drink, sorry watch. OK, those statements are a little tongue in cheek, all sports are good. Seriously though, the dedication needed to compete in the Tour de France and the strategies and tactics make it such a stand out event. The Tour de France is an annual three week stage cycling race primarily held in France, but also goes into other countries. The 2017 race is starting in Düsseldorf, Germany and is the 104th event in the Tours history. The race was first organized in 1903 to increase sales for the newspaper L’Auto. The race has been held annually since its first edition in 1903 except when it was cancelled for the two World Wars. The Tour de France, the Giro d’Italia and Vuelta a España make up cycling’s prestigious, three-week-long Grand Tours. It’s the Tour that captures the imagination though, where winning a single stage is something every rider dreams of, never mind the whole event. Running from Saturday July 1st 2017 to Sunday July 23rd 2017 it covers a total distance of 3,540 kilometres. For the uninitiated, the Tour can be a complex bike race. It is worth understanding a few things to get the most out of it. There are a number of jerseys that the riders are competing for, with the yellow jersey being the most important. The Yellow Jersey is worn by the leader of the general time classification (i.e. the quickest overall time in the race). The Green Jersey is worn by the leader of the general points classification. Points are awarded at the intermediate sprint in each mass-start stage and the finish of each stage. The Red Polka-Dot Jersey is worn by the best climber in the general classification. Mountain points are awarded at the top of every categorised climb. The points for a summit finish are doubled. The White Jersey is worn by the best young rider (age 25 or under in the current year) in the general classification. The Combativity Award is given out at the end of each stage by a jury made up of cycling specialists. The chosen rider is seen to be the most progressive and aggressive rider over the stage. An overall winner is chosen after the last stage of Le Tour. The winner wears red-coloured race numbers in the next stage. The Team classification is calculated by adding the times of each team’s three best riders on each stage. Riders in the team leading the classification wear yellow helmets and race numbers. How many teams and riders are their in the Tour de France? There are 22 teams competing in this year’s Tour de France (2017). Each team has 9 riders. So in total there are 198 professional cyclists competing over the grueling competition; however, quite a few don’t make it to the end. Why does each team have 9 riders? To answer this question you need to understand the role of the team. For Team Sky, Chris Froome is the GC (General Classification – AKA main rider who they want to win the event) guy. The whole team revolves around him. Everything that the team does is focused solely on making sure he wins the Yellow Jersey and the Tour. Basically the other riders in the team sacrifice themselves so that the top GC rider does as best as physically possible. Understanding this team strategy is key to understanding how the Tour de France (and other Grand Tour races) work. Just a side note. Quite often the winner of the Tour de France does not win that many individual stages. Because there are specialists on the hills or on the flat, these riders tend to win these stages, but overall the consistent quick times of the main GC rider means they are the fastest at the end of the Tour. Each cycling team is made up specialists who excel in a particular activity. These include climbers (specialists on hills), rouleurs (strong men) and super-domestiques (riders who work hard to keep the main man at the front but ultimately sacrifice themselves because they have used up all their energy). The latter are riders who in another team, could be the main GC guy! Sky’s pockets are so deep, they want to ensure Chris Froome gets help from the very best. Christian Knees will proudly take to the start line of his 17th Grand Tour at the Grand Depart in his homeland. The German brings a wealth of experience to the table and will relish racing his first Tour de France since 2012 on the back of a resurgent 2017. He performed his typically strong and selfless role throughout the cobbled Classics campaign, then looked after Chris Froome on the flatter days at the Criterium du Dauphine. A hugely respected member of the squad, Knees will be a crucial part of the Team Sky lineup. Colombian climber Sergio Henao is enjoying the finest season of his career. Fresh from winning the Colombian national road championship in February the 29 year old won a thrilling edition of Paris-Nice, before enjoying a strong Ardennes campaign, co-leading the team alongside Michal Kwiatkowski. Henao is viewed as one of the fiercest competitors in the peloton, and Froome knows he can rely upon the loyal Colombian come rain or shine. Amongst his many talents, Luke Rowe can also claim to be one of Chris Froome’s lucky charms – Froome has won both editions of the Tour that Rowe has raced, in 2015 and ’16. Road captain on both occasions, the popular Welshman will have a huge part to play again in 2017 after another encouraging campaign for the Classics specialist. An impressive third place finish at Kuurne-Brussels-Kuurne in March was further evidence of Rowe’s development and he played a pivotal role in Sergio Henao’s Paris-Nice win, marshalling him through the race’s early crosswinds. 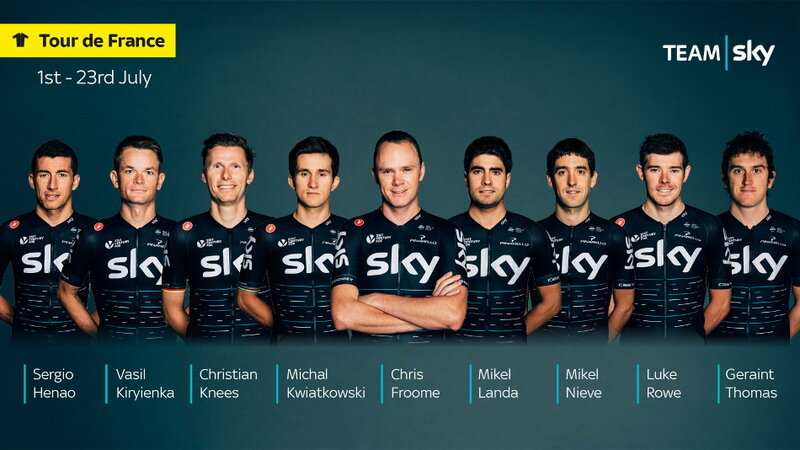 As you can see, the team is built entirely around Chris Froome. Other teams will be similar, all supporting their hope to win the GC / the Tour overall. It’s going to be an amazing three weeks. Let’s hope there is some incredible riding, amazing views, exciting stories and no big crashes. Best of 2016 TDF video – brilliant! There you go, hopefully you are very excited about this years Tour de France. We certainly are. If you did not already know much about the Tour you do now (after reading this guide), so you can sit back and enjoy the strategies, tactics, and full throttle racing.